a dreamscape, of forms and colored movement just at the edge of perception.. 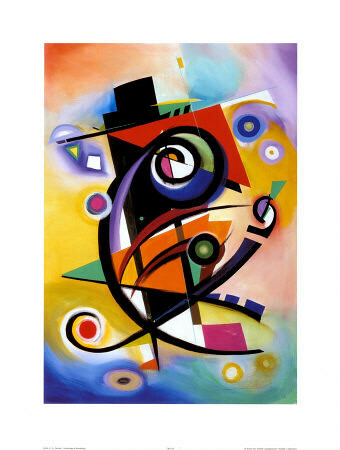 Check out "Alfred Gockel homage to kandinsky"..http://farm4.staticflickr.com/3137/2...edf015e716.jpg Came to mind after seeing your painting. Or I could have gone with...Who's the crazed dude with the cigar wearing the derby hat? Last edited by stevemawmv; 07-28-2014 at 09:56 AM. Wow thanks Steve for the encouraging comments. I was not familiar with Alfred Gockel but looked him up, I feel like I just found my artistic brother!... love his colors, lines and lyrical abstract figures, and musical instruments, I will have to look at more of his work... so a BIG THANK YOU for that tip !.. Again with a stunner! you're on a roll. Now go back to sleep. . . but only a little ways so we can look in. . .
Go Van Winkle! A right Ripster ye are, laddie. . . I see a large insect creature with 3 big, sharp, blooded teeth rising through a bed (viewed from above) to engulf and devour the dreamer. LOL... thanks my friend there are qualities in this I like that softness that has crept in in a few of my recent works.. Thanks Caesar, I frequently have these fragments of shapes and colors moving around just as I go to sleep, sometimes I can organize them and I try to remember them for future works, not always successful at that. They are a language with its own meanings , but in this work I was able to allow the process to work while at my computer... a lucid dreaming as it were... btw.... congrats to Vincenzo Nibali's impressive victory in the Tour de France..
Last edited by gxhpainter2; 07-29-2014 at 04:13 AM.